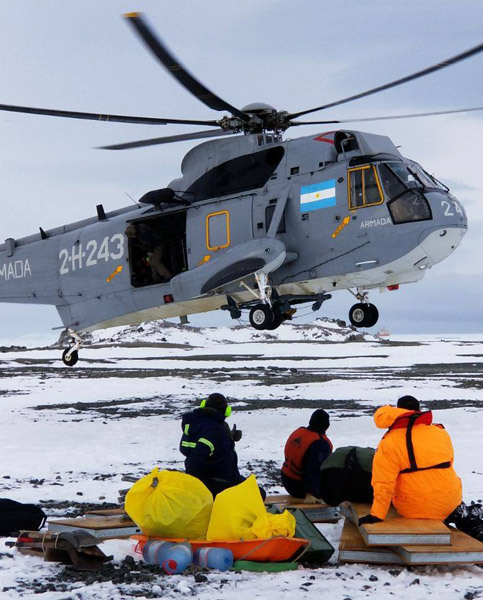 Argentine Navy rescue personnel, wait for the helicopter to land. The story: Principal investigator Alexander Simms, from UCSB, along with his 3-person research team and one ASC employee, were on Joinville Island (about 20 miles northeast of the Antarctic Peninsula and 100 miles southeast of King George Island). They were investigating newly discovered raised beaches--a sign of changed sea levels due perhaps to past global cooling and warming, using precise GPS mapping and GPR. While ice conditions had permitted the Laurence M. Gould to drop them off in mid-February, on about 9 March severe ice conditions were encountered about 8 miles from Joinville Island, and the LMG could not approach any closer. Argentina was contacted, and their helicopter-equipped Navy icebreaker Almirante Irizar was in the area. They agreed to offer assistance. 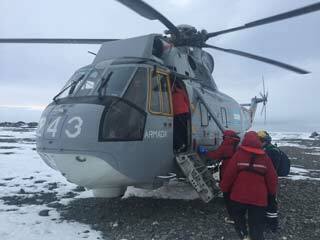 On the morning of 11 March local time, a helicopter safely extracted the science team, along with about 880 lbs of gear and scientific equipment. Arrangements were made to transfer the US team to the LMG as weather permitted. Below, a few more photos. All of the photos on this page are from Argentina's Ministry of Foreign Affairs and Culture Facebook page. 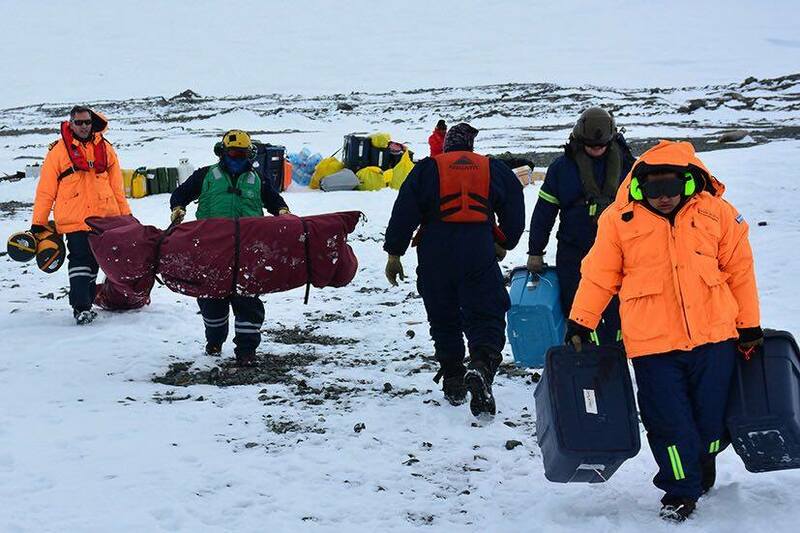 The science team and Argentine naval personnel carry gear to the helicopter. Looks like lots more than 400kg of stuff to me. 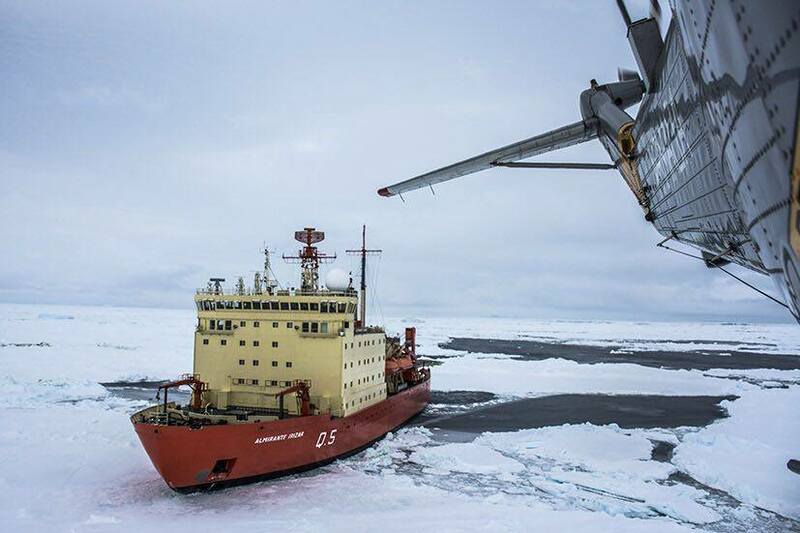 At left, the Almirante Irizar as seen from the helicopter. This hardy vessel has been around for awhile; it was built in Finland in 1975, and I saw it at some point during my trips to and from Palmer Station in the late 1980s. Below, a video from the helicopter, shared on Twitter by the Argentine Navy. Other news coverage includes this BBC News article, a MercoPress story, and this this phys.org article which includes a photo of the team's tent and gear.